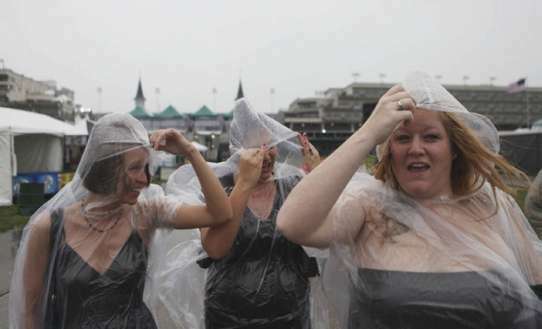 So I have never been to the Kentucky Derby, Kentucky, or a horse race for that matter, so I might not understand the fascination with the whole thing, but that doesn’t stop me from finding humor in the whole thing. 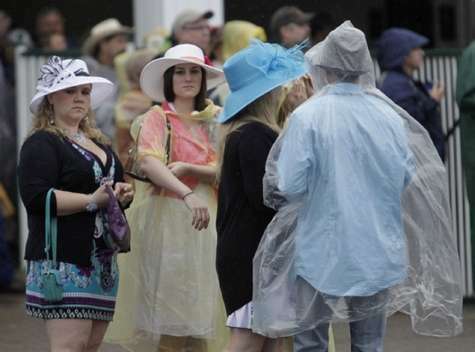 It’s raining in Kentucky right now during their infamous Derby and the wide brim hat women in 5 inch heels are not to pleased. However, they have been able to make plastic look about as chic as it did in the 1960’s. 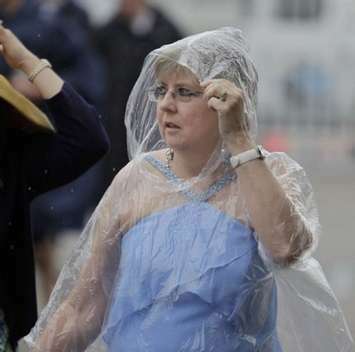 They are covering everything from their tight, bright dresses reminiscent of prom night up to their 2 foot diameter hats with a clear plastic coating that is just too hard not to make a little bit fun of. Though, I am sure that if I were to be in their position I might (and that is a big might) do the same. First, I love this woman. She is wearing one of the largest hats I have ever seen and she has managed to make a suffocation hazard look near chic while perfecting the perfect “pissed off” facial expression. Pretty impressive. 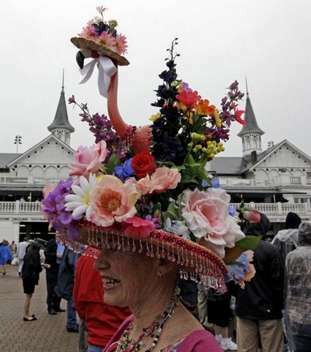 This woman is obviously trying to trump the woman above with her opulent, over the top lawn decoration flamingo hat, but with the dreary weather it looks completely out of place. This woman is pretty fabulous, I could absolutely see her on Real Housewives of Kentucky. This girl is great with her matching hat and dress (most likely dyed to match) and even the plastic looks like it has a pink tinge to it, making her look like a cow boy ready to ride off into the sunset. 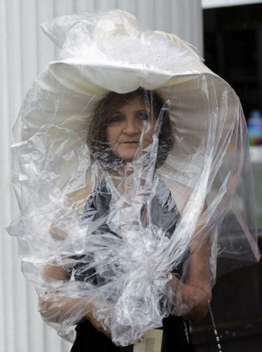 Prom dress trend I was speaking of earlier paired eloquently with a plastic cape and hood. 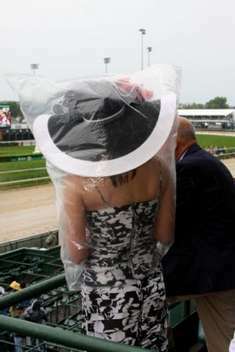 I love this girl trying to show up her friends by not donning the plastic (yes, that would be me). 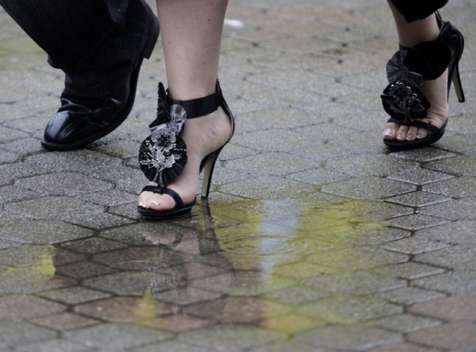 High heels and puddles always work so well for me. And I would love to know which designer decided that black dollies would look good on shoes. Apparently the Pink Ladies are back and better than ever. 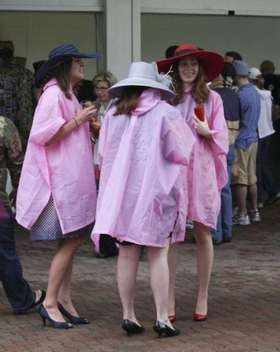 But seriously, just because the three of you match, doesn’t make the fact that you are wearing a pink plastic hair cutting cape with red, white and blue hats, any better. 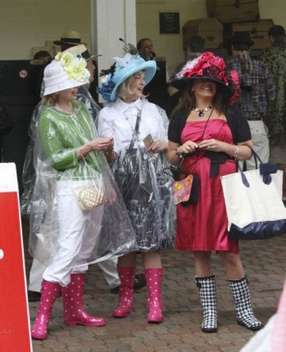 Ah yes, the Wellies are making an appearance and both the pink spotted boots and the black and white checked ones go so nicely with their overly bouqueted hats. Apparently these three were al bridesmaids in a recent wedding, or they are coming from an overly dressy funeral.